Rushad Eggleston stands in the vanguard of the younger generation of virtuosic cellists who are bringing this relatively unwieldy instrument into the spotlight. It's anyone's guess what may happen when Rushad takes the stage, but we do guarantee one thing: a night of fabulously inventive, supremely virtuosic, endlessly surprising music. Rushad never fails to knock his listeners' socks off as he ushers them in a joyful, eccentric alternate reality. He challenges the fundamental ideas about musical genres, rules, and boundaries–not to mention appropriate footwear. 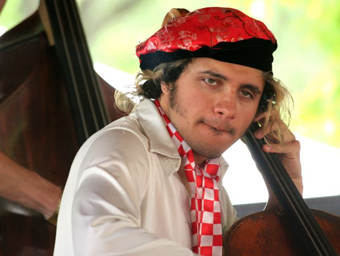 Raised in Carmel, Rushad was the first string student admitted to Boston’s prestigious Berklee College of Music on a full scholarship, and before graduating made his large-scale recording debut, joining fiddle masters Darol Anger, Michael Doucet, and Bruce Molsky in the group Fiddlers 4. Since then, Rushad has toured extensively with Darol Anger's Republic of Strings, Fiddlers 4, the beloved folk/bluegrass group Crooked Still, and his current group, the rocking ensemble Tornado Rider. Rushad continues his quest to leap exuberantly across boundaries and baffle expectations at home in Oakland and at festivals such as Burning Man, the Suwannee Springfest, and Florida's Magnolia Festival.